When the farmers here look out across their land to survey the fruits of their labor, the backdrop they see is not rolling hills but a beautiful view of the Manhattan skyline. 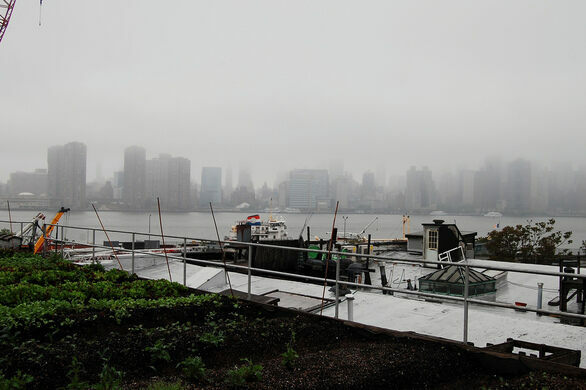 That’s because this farm, the Eagle Street Rooftop Farm, is located on 6,000 feet of warehouse rooftop in Greenpoint, Brooklyn. An organic vegetable farm, it supplies the neighborhood with “hyper-local” food, producing much of the greens and veggies for restaurants in the area such as Paulie Gees, Anella and Ovenly. The farm was financed by the owners of Greenpoint based soundstage Broadway Stages and the creation of the farm was no small task. 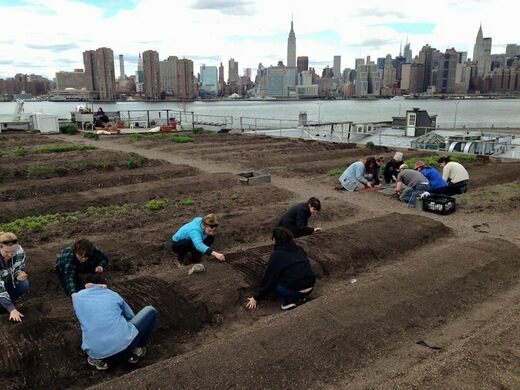 It involved lifting 200,000 pounds of compost, rock and shale (“the growing medium”) onto the rooftop to create a soil bed of 4-7 inches for the plants. Today the farm grows hot peppers, cherry tomatoes, cucumbers, eggplants, spinach, kale, beans, salad greens, peas, carrots, and radishes among other crops. HBO series' stage tucked away in a Greenpoint lot is the largest theatrical set of its kind in the United States. Self-sufficient greenhouse floating on the Hudson River.